As a young woman in 1898, Theresa Huntington left her New England home and traveled to another world. For seven years she lived and worked in Harpoot (Kharpert) in the Ottoman Empire. She wrote home regularly. In addition, Theresa gives us an insider's portrait of a missionary community and its relationship to Armenians and Turks during the reign of Sultan Abdülhamid II. Well-written and fun to read, this volume is an excellent introduction to Armenian social history in the late Ottoman Empire. Stina Katchadourian (MA Stanford '67) grew up in Finland as a member of that country's Swedish-speaking minority. She is an author, literary translator, and journalist. Among her interests are women and the Middle East. She is a member of the Board of Directors of The Global Fund for Women and her many publications include a memoir about her Armenian mother-in-law entitled Efronia: An Armenian Love Story. Stina lives with her husband on the Stanford University campus near San Francisco, California. 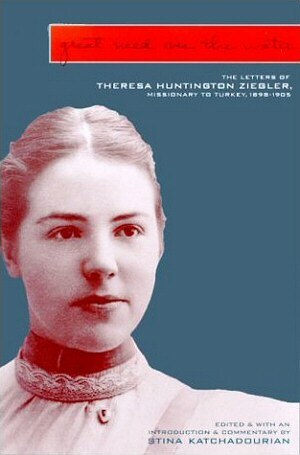 Great Need over the Water: The Letters of Theresa Huntington Ziegler, Missionary to Turkey, 1898–1905 - Amazon's online bookstore.